Love Your Ego: EGOtorial: Hearty pancakes! Oh yes Egos! I'm going to talk food again! With me being in such a good mood and all I felt motivated enough to cook for myself again! Of course I couldn't resist to take a few photos on the road. So here's another EGOtorial. Step 1: Get your ingredients safely home! Yes this step should have gone without saying but my dear sister had to let the eggs fall down in the elevater. Just seconds away from our kitchen. Anyways with that she kind of made it easy to decide how many eggs would go in the mixture later on. There weren't that many left after the crash. Step 2: Prepare the ingredients! For the dough you need eggs, flour, milk and a pinch of salt. Also prepare some oil for the pan later on. The toppings are entirely up to your liking. I wanted to have my pancakes Hawaiian style. So I got some ananas, ham and cheese. My sister is sooooooo addiced to sauce hollondaise which basically goes with everything in her opinion :D So she would eat that with either ham or salami. Mix eggs, flour, milk and salt with a whisk. Yes, we're doing this old school! No hand mixer whatsoever! It's important that you start with the dough first because the dough gets firmer the longer you let it rest. 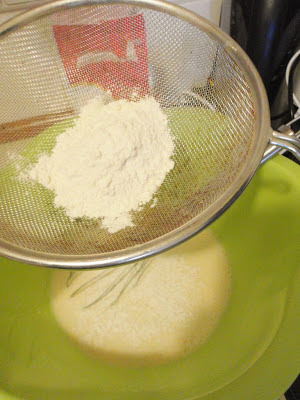 Also I have this little tip on how the flour won't clump while whisking. Use a filter and gently sift the flour into the bowl. You know how I love these vacuumed meet packages... Again I had to wrestle the sh*** open. 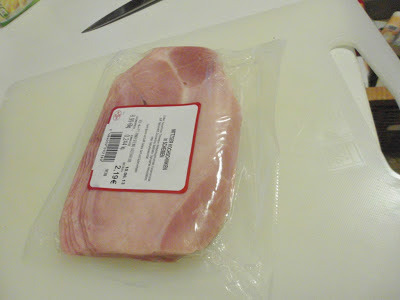 I just don't understand how other people get their meat out of these packages.. It's such a mystery to me. Cut your ingredients in little pieces so that you will only have to sprinkle them on your pancakes later on. Luckily the cheese was already done. Step 3: Use your pan! I tried several methods on how to do the pancakes. You can pour in the dough, roast it on both sides, then add chese, the other ingredients on top of the cheese and then another layer of cheese. That works fine. However you can also just add the dough and put all of your ingredients on the liquid side so that the meat and ananas stick to the pancake well. Keep the whole thing in the pan until the cheese has reached the preferred consistency. You can also fold one side over the other like my sister did. Oh yeah! It looks soooo delicious!! If you eat a lot of them they'd probably ruin your body but with all the toppings you won't be able to eat more than two. You can also add more veggies. So no worries! This is such a ressourcefull recipe and there are so many different ways you can do these hearty pancakes. I totally love it! Now who's gotten a little hungry after reading this?